Manitou’s professional and friendly staff spends its summer living, eating, teaching, coaching and playing with Manitou’s campers for seven weeks a year. The typical day begins at 7:30 a.m. and lasts until at least 9 p.m., which is bedtime for the youngest campers. All male staff members live in cabins with six to twelve campers and two to four other staff members. While your days are busy and filled with activity, Manitou provides its staff with ample time off to recharge. There is no better place to be during the summer than central Maine, which in addition to its natural beauty, offers an abundance of outdoor recreational opportunities to take advantage of each summer. All of Manitou’s staff are specialty counselors – on top of being a cabin counselor they teach and coach in one of Manitou’s forty activities. No staff member is limited to one area of camp all summer, however. 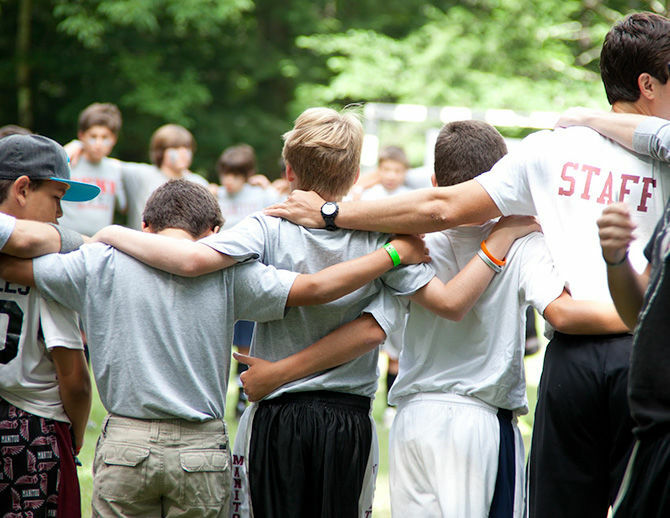 We encourage staff to explore all of their talents and serve in several areas of camp. Staff participate in Manitou’s intra-camp College League, Color War events, and have the opportunity to play on staff teams, act, or help design sets and costumes for evening theater and stage performances.